CostcoThe Costco bear is nearly eight feet tall. 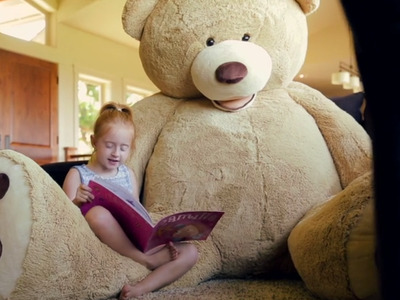 Costco customers obsessed over its giant bear when it first hit stores in 2014. The bear has its own Wikipedia entry and a meme-filled Facebook page set up by fans. Costco confirmed that the bear will be available online and in some of its stores again this fall. Costco’s giant bear is world-famous. There are more than 15,000 posts on Instagram under the hashtag #CostcoBear. Some Costco shoppers have even gutted the bears and turned them into costumes. But it’s not just US shoppers who are fascinated by the bear. Among the #CostcoBear posts, you’ll find hundreds of Japanese shoppers posing in stores with the bear. Costco Japan is a wholly owned subsidiaryof Costco US, which means that it stocks many of the same products, including the famous bear. A Costco spokeswoman told Business Insider that the giant toy will be coming back online and into some stores this fall. She would not confirm how much the bear would be sold for. However, smaller versions have been sold since. In October, a 4.4-foot bear toy was offered for $US24.99 to Costco members. Similar versions are now being sold for as much as $US300 on eBay. It seems like it’s becoming a collector’s item.